If you are looking for quality, reliability and excellent service then look no further than California Vending Service. We are dedicated to providing the right vending solutions for your business, large or small. We are not some national conglomerate, we’re locally owned and the quality of our service shows as we serve customers throughout the Los Angeles, Orange and San Bernardino counties. Our goal is to provide the products that will keep your employees or customers happy and provide a hassle free experience. Contact us today at (1800) 913-8363 for superior vending and coffee services. California Vending Service is committed to offering a wide variety of brand name beverages and snacks so your employees and customers can find the items that they really want. California Vending Service realizes that businesses are vastly different. 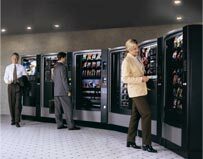 We provide customizable vending solutions and the latest in vending technology to make sure all of your vending needs are addressed. Our goal is to meet your company's needs so your employees and customers walk away happy.